This writing is from a piece written by Leon for Sidetracked magazine. Click here to see the piece in its original form. I turned to see only dust. Even with the deafening wind as our overbearing host on the plateau, a thunder of hooves had made itself heard in fits and starts. It is a sound that can promise great flights of freedom, or awful depths of despair. This time it was almost certainly the latter. I held on tightly to the rough leather tether of Rebelde and stepped forward into the cloud. He was the horse we’d always thought would cause trouble, but his name was misleading. He was stubborn, yes, but not mischievous, nor impatient. Those traits belonged solely to Aiken, our majestic dappled grey Criollo horse and a natural leader whom I now saw, as the dust cleared, galloping off into the steppe. He bucked and reared, wheeled and kicked, unloading with great malice the bags that had so recently been neatly packed on his back. All three of our human contingent were dismounted, having just crossed over a wire fence with the animals, and we watched in helpless hopelessness as the usually calm Viejo and Petiso set off in earnest after Aiken. I looked first at Tom, then at Jose, then back at the melee before our eyes. We had lost control of three of our five horses and our belongings were spread out across a worrying large section of the Santa Cruz valley. It was not an auspicious start to the second week of our expedition. I’m certain that almost everyone who reads this will know the name of Charles Darwin. Most of us would probably be able (at the very least) to also connect him with the theory of evolution. Few, however, are likely be aware that as young man in the 1830s he was little more than an unknown fresh-faced explorer, travelling in a research boat tasked with charting the waters of South America. 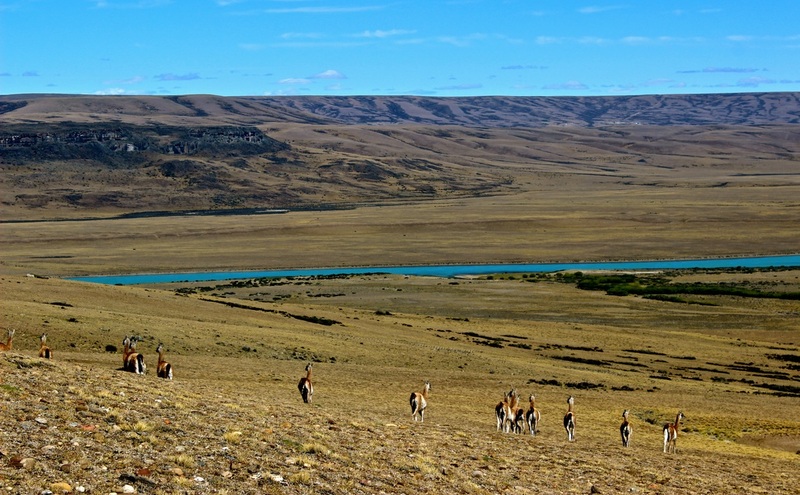 I came across this story of his early life by accident in September last year and not long afterwards I found myself sitting atop a horse in the Patagonian steppe, retracing one of Darwin’s early expeditions. It’s funny where life takes you. The Santa Cruz River winds its way from the foothills of the Andes out to the Atlantic Ocean on the east coast of Argentina. 180 years ago Darwin, Captain FitzRoy and about twenty-five other brave souls tried to ascend the river from the sea, hoping to discover its source. I wanted to follow in their footsteps to try and capture something of the spirit of their adventure, but also to document the Santa Cruz for perhaps the last time; this year it is set to be dammed, and the history on its banks looks destined to be lost forever. The damage to ecosystem and environment are an even bigger concern. For company on the quest I brought Tom Allen, an English friend and filmmaker who I previously travelled with in Iran, and Jose Argento, a man I met on the internet. It seems acceptable to do such things these days, and it felt especially so here as Jose was an Argentine who knew the region well. He was a horseman through and through, and would excuse me from Spanish-speaking duties – a blessing not just for me, but for all those we met too. 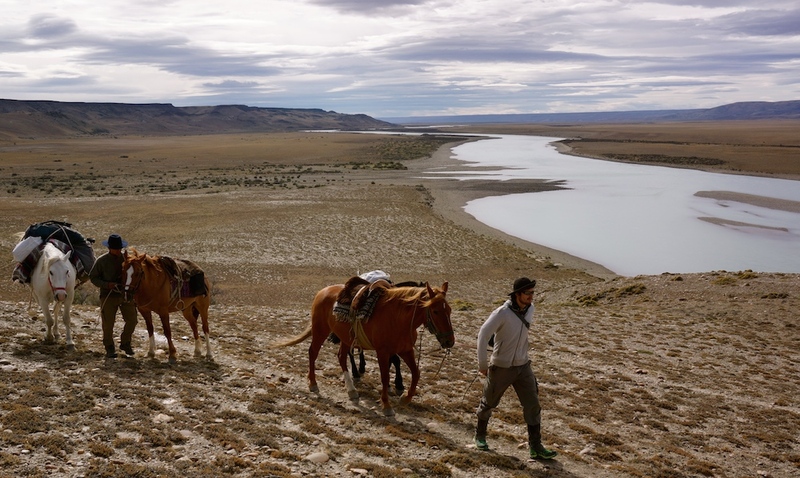 Patagonia is peerless as a wilderness area, and with few roads and hundreds of miles between settlements, horses are the only way to travel freely. That’s how I justified the decision to take animals, anyway – it was also a prime opportunity to at least once in life wear a cowboy hat non-ironically. We travelled with five horses, of which two would be pack-animals. Tom remarked to me as we walked around the corral choosing them that he was ‘actually slightly afraid of horses.’ He had only ridden once before, and hoped the expedition wouldn’t be too painful. He was, of course, very wrong. I too was rusty in the saddle, but I took comfort in the fact that Jose’s expertise would keep us right. It was also encouraging to see that Tom was struggling much more than me. We began on a cloudy, non-descript morning at the Atlantic Ocean, standing as a team of eight on the same stretch of beach that Darwin once did. After the necessary photos and filming at the point of departure we could delay no longer, and began shakily riding north along the shoreline. That first day took us up a narrow estuary, the flatness of the ocean on our right met by an opposing overhang of crumbling brown rock to the left; under foot (or hoof) was fine rocky shingle, and embedded in many of the pebbles were the fossilized remains of creatures long-since extinct. It’s not beyond conjecture to suggest that the young Charles Darwin saw in these fossils the first hints to him that the world was not as it had always been. His diaries betray a whirring of cogs in his sharp, eager brain, and this may have been an extremely formative stroll for the future evolutionary scientist. We soon turned west, and the river began to lose its salinity. Taking stock, we noted that our speed was fair, the horses hadn’t galloped away in a huff and Tom was yet to fall off. Things were good. A small town came and went. It was the last we’d see until the final day of our journey. It was also home to the only bridge for four hundred kilometres – all stark reminders of just how empty the land around the Santa Cruz river is. This is the irony of Patagonia; there is the life-giving Atlantic Ocean on one extreme and the lush forests of the Andes on the other, but in between is practically desert – unforgiving and hostile to those seeking subsistence. With each passing plod of the horses, the landscape seemed to grow before us. The further we went into its depths, the bigger it became. The sky filled an area larger than I’ve ever known. I’ve heard Montana called ‘Big Sky Country’, but it ain’t a patch on this place. Nights were often spent under the stars, steeds calmly grazing by our feet. We slipped off to sleep with the cool evening breeze at our faces, comfortable on a bed of assorted woven rugs that would then spend the days as padding under the horses’ saddles. More than anything else it was this simple arrangement – to my mind wholly authentic – that made me feel like a real gaucho. I was deluded, of course, but at least I was content. Occasionally we came across an estancia; a simple homestead that would once have been the centre of a large area of land. By large, I mean sometimes in excess of 70,000 hectares. Sadly though, we now found most of the homes to be empty. Almost entirely dependent on the wool trade, these places suffered badly when the bottom fell out of the market twenty-odd years ago. There is little else to sustain a livelihood out in the steppe. On any journey there are certain features that come to dominate the experience, and here in Patagonia it mostly seemed to be about wind. I grew up on the north coast of Northern Ireland, and I thought I knew about windy places. It turns out that anything I’d found there was but the lightest breath compared to a Patagonian blast. Most days in the steppe the gusts began with sunrise and proceeded to build themselves up into a ferocious fury over the course of the day. Speeds surpassed 120 km/h at times – that’s practically hurricane-force – and we could do little else but hunker down on the horses and let them lumber impassively onwards. Conversations between riders were reduced to the occasional roar to check if it was time for a break, and if it was we’d dismount and shiver behind the bulk of our animals. If this sounds miserable at times, then that’s good – it often was. Misery, of course, is key to a successful expedition. Any fool can go to the other side of the world and be happy. There’s a huge sense of reward to be had in pushing oneself to deal with – and perhaps even thrive in – such circumstances. It’s so often the hardships that help illuminate clearly the beauty and wonder around us. And, despite the harsh terrain, wildlife was abundant – a fact that cannot fail but cheer up a weary traveller. Guanacos – odd, gangly, llama-like creatures – wandered in large numbers wherever we went; ostrich-esque Rhea birds ran around our periphery. Wild horses came storming up to see what all the fuss was about, armadillos and foxes watched from a distance, and flamingos and condors took turns to dominate the skyline. In the river itself there was an abundance of trout – a European import that had flourished in the cool glacial waters. Jose’s evening fishing sessions quickly became a highlight, adding much needed nutrition and taste to our stocks of pasta and tinned veg. The landscape too was stunning. 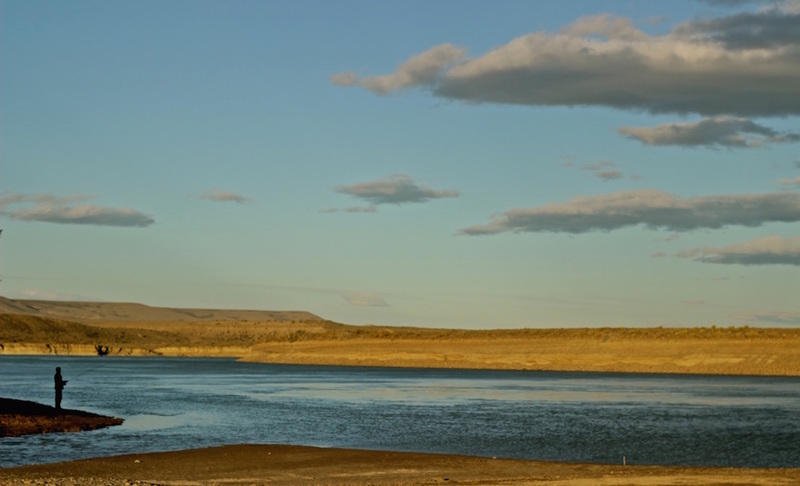 A ludicrously clear blue ribbon of river wound through a yellow hue of steppe before us. On either side of the valley the ground rose to epic plateaus that folded in, enveloping the traveller in a funnel of wilderness. Hardy bushes punctuated the rocky floor and the longer we spent there the more we realized that, despite first appearances, it was a place teeming with life. As the days rolled on, we became naturalized to the lifestyle. Our mornings and evenings were busy with the animal husbandry, and the days physically exhausting. Riding requires a strong core and works muscles that otherwise get used very little. We all ached, but Tom as a newbie suffered most of all. The wind and sun weathered our faces, hands become hard and worn working with the leather tack, and we were often dog-tired. Yet I was happy – so happy – to be out in the great wide world, surviving on my wits and stepping each day into a new unknown. We had then just that one major disaster, when Aiken took fright at some unknown spectre and threatened to disappear forever off into the steppe. In the end he slowed just enough for Jose to catch him, and once the ringleader was captured the others followed suit. A meticulous search was made of the area and our gear recovered. A solar panel had been smashed and a tripod destroyed, but other than that we were lucky. Cameras, hard-drives and other valuable came through unscathed. We lost no food, and the biggest damage of note was simply to the trust we’d formed with our equine companions. Compared to Darwin’s journey, we had it easy. The crew of 1834 suffered terribly with cold weather and the constant perceived threat of hostile natives. They toiled terribly along the riverbank, dragging behind them three whaling boats filled with supplies. At each bend of the river they would have to decide whether to stick to their side, or switch to the far bank for a better terrain on which to pull. Rapids required complex pulley systems that left all exhausted. Sadly, after all their trials, they never did make it to the lake that feeds the Santa Cruz. Demoralised and low on rations they finally turned back after three weeks of trekking. The valley had flattened out, and they couldn’t find any real elevation to see what lay ahead. As it was, their westernmost point was just a mere ten kilometres from the river’s source; they would have been heartbroken to know how close they came. We paused at the co-ordinates of their turn-around and tried to imagine the despondency they must have felt. It is a stark place to fail. It took us only three more hours to reach the lake ourselves – stretching out into the distance with the snowcapped Andes behind – and our journey too came to an end. I feel thoroughly privileged to have seen the region for myself. These adventures – any adventures, big or small, far-flung or local – give me a perspective that I wouldn’t otherwise get. To travel on foot, or by horse, is to truly be immersed in a place and I think it is one of life’s great pleasures. Now, back in the city, stooped over my computer with yet another cup of coffee to hand, I’m already dreaming of what might come next. I only hope that as a species we stop destroying our wilderness areas, or else soon there may be no place left to go.